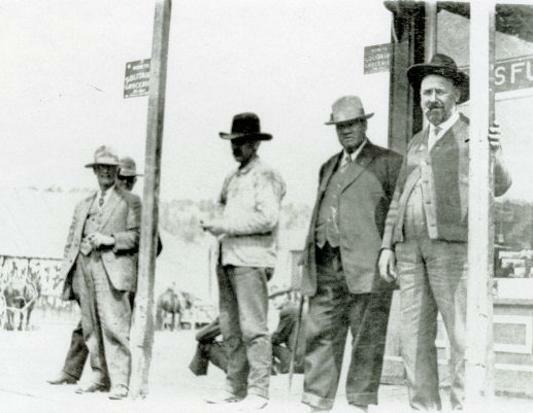 John Love is second from the right in this photograph taken in front of the E. E. Glenn Store. 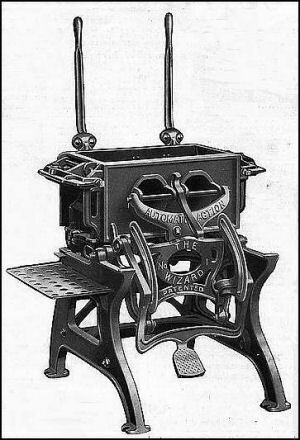 Type of block machine used by Mont Fulford. 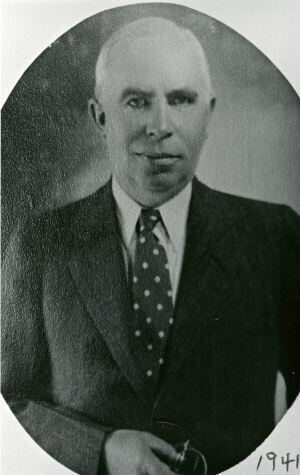 Hume White shown in a 1941 photo. John Love came to Colorado in 1860, originally drawn by the gold excitement. He mined in Breckenridge and Summit County and also ranched in Park County. In 1882, Love became intrigued by the possibilities of the Eagle River Valley as livestock and ranching country. Along with pioneers Webb Frost and George Wilkinson, Love was the first to bring cattle to Brush Creek. Love established a homestead four miles south of Eagle on Brush Creek. His first wife, Ellen (Frost) Eaton died in 1898. Love, a very large man, was prominent in the county, serving as a county commissioner from 1898-1900. He also owned a group of mining claims at Fulford. Several years after the house was completed, Love added a carriage house in the back, also made from the cement blocks.